accompanying persons - snts2019s Webseite! Meeting point: outside, at the main entrance of the lecture building (Hörsaalgebäude) at 11.05 am. The Philipps-University of Marburg was founded as the first Protestant university in 1527 by Duke Philipp of Hessen. 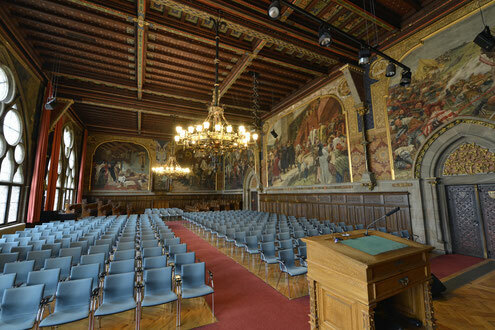 At the end of the 19th century the main hall in the central university building was renovated. Highlights of the new old building “Alte Universität” are eight historical paintings by Johann Peter Theodor Janssen (1844-1908). There are painted scenes from the history of Prussia, including the meetings of the church, represented by Luther, Calvin, Bucer, with the state, represented by the Duke Philipp of Hessen at the Marburg colloquy of 1529. The paintings do not only tell history but are pieces of Germany’s Culture of Remembrance in the late 19th century. The Roman Catholic church of St. Peter and Paul was built in 1957-1959 when, at the End of World War II, many Catholic German refugees from the former eastern parts of Germany came to the former protestant city. The church is fascinating for its stained glass windows. Walking distance about 3000 m.
Meeting point: outside, at the main entrance of the lecture building (Hörsaalgebäude) at 2.00pm. Saint Elisabeth of Hungary (German: Elisabeth von Thüringen) was born in 1207 in Hungary and married Louis IV, Duke of Thuringia at the age of 14. 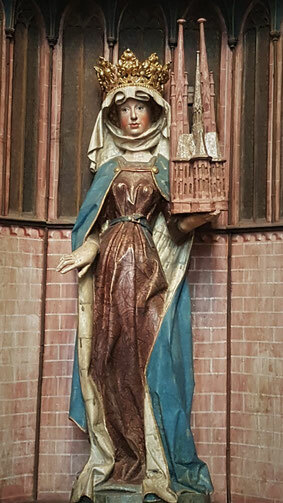 After her husband's death in 1227, Elisabeth moved to Marburg, sent her children away and regained her dowry, using the money to build a hospital where she herself nursed the sick. She became a symbol of Christian charity after her early death in 1231 and was canonized in 1235. St. Elizabeth's Church was built from 1235-1288 by the Order of the Teutonic Knights. Her tomb made the church one of the most important pilgrimage destinations of the late Middle Ages. In the 16th century, the church became protestant and hosts to this today the grave of the Duke Philipp of Hessen (1504-1567). The Elisabeth church is the earliest example of German Gothic architecture and hosts major works of religious art. After a guided tour of the church itself we will follow the footsteps of this extraordinary saint. We will see the ruins of her hospital, the graveyard for the pilgrims, and head up to the Lutheran Pfarrkirche St. Marien, a church that hosted the Lutherans in Marburg after the duke Moritz of Hessen Kassel converted himself and the university to the Calvinistic faith in the early 17th century. Walking distance about 3000 m.
Bergpark Herkules Copyright: © Kassel Marketing GmbH. Meeting point: Erwin-Piscator House (across the street from the Hörsaalgebäude) at 8:30 am. The city of Kassel, about 90 km north of Marburg, has one of the most important collections of museums in Germany, and Bergpark Wilhelmshöhe has been listed as a World Cultural Heritage Site. Every five years the city hosts for 100 days the world famous exhibition of modern art, the documenta (last time 2017). After an 80 min bus ride we will reach Kassel and have a walking tour (about 3500 m) to see some of the sixteen outdoor documenta objects of modern art that were originally planned as temporary exhibits but have been permanently preserved in Kassel. Among them are the Pickaxe of Claes Oldenborg from 1982, the 700 oaks of Joseph Beuys from 1982-1987, the man walking to the sky of Jonathan Borowsky from 1992. 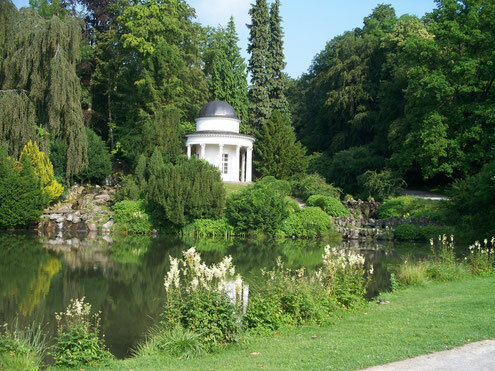 After lunch we will have a bus tour through Bergpark Wilhelmshöhe, an outstanding example of European garden design founded already in the 17th century and a UNESCO World Heritage Site since 2013. Visiting the park gives you the opportunity to experience the various landscape design concepts as a representation of absolutist mastery over a period of 300 years. The monumental baroque park architecture with the Octagon and the eight-metre-tall Hercules Statue, which is the symbol of Kassel, are noteworthy. We will be back at Marburg about 5.45 pm. Minimum number of participants: 19 persons. 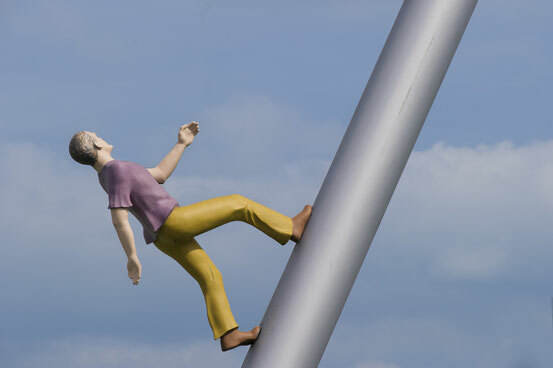 "Man walking to the sky", Jonathan Borowsky. Copyright: Kassel Marketing GmbH | Fotograf: Paavo Blåfield. Meeting point: outside, at the main entrance of the lecture building (Hörsaalgebäude) at 9.00 am. The brothers Grimm studied at Marburg from 1802-1805 and started here their world-famous collections of fairy tales. The Marburg artist Otto Ubbelohde illustrated them in the early 20th century with many Marburg motifs. The tour will lead us to the major places that inspired the work of the brothers Grimm and their illustrators, including the stairway to the castle from where one has a beautiful view above the city and a beautiful park with a rose garden. Finally there will be time to visit the castle, the residence of the Duke Philipp of Hessen. 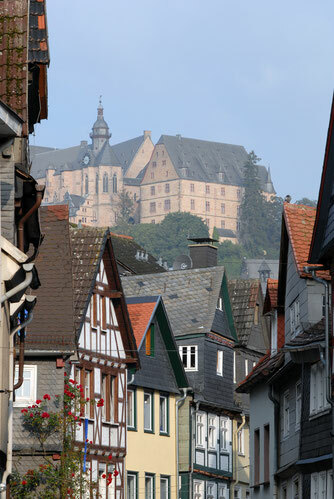 The castle was founded in the 11th century and holds today an exhibition of Marburg’s cultural history. For those who do not want to walk uphill there will be transport by taxi to the castle. Walking distance about 4000 m.